Last week, I had so much fun attending Fashion X at River Oak District. It is my first time live sketch at this three day Houston fashion show and I am so excited to see what Texas-based designers have in store. 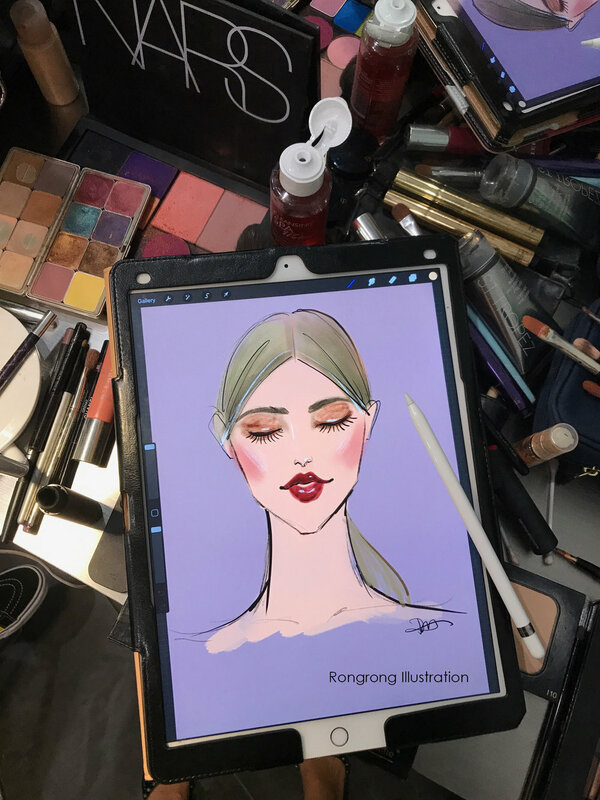 I tried to use multi-medium as well as Ipad digital painting fashion and beauty illustrations at the backstage and during the show. It is a great opportunity to be part of this fashion festival and I am astonished by how talented those designers are! Maybe FashionXHouston can be next NYFW!! Hope you enjoy those illustrations I created in 5-15 mins. Yesterday, I had a great pleasure working with Macy's at their Galleria location to do live sketching for the customers as part of their Fall Fashion Event. The event was hosted at the Houston Galleria Mall, 2nd-floor women's department. Customers who purchase over $50 can receive an exclusive beauty box as well as get their very own customized fashion sketched by me! Big thank you to lovely ladies who are following me on Instagram and came to the event, your support means a lot to me and encourages me to keep doing what I love! Hope you enjoy the photos from the event. I had a blast ;-) Look forward to working with Macy's in the near future! At the meantime, feel free connect me over on Instagram and leave a comment about any thoughts or questions you have ;-) Happy Sunday! I had a wonderful time live-sketch guests at Maybelline New York booth at BeautyCon Festival this past May. It is a festival which brings the biggest content creators, celebrities, brands, and fans together to celebrate beauty, self-expression and staying true to themselves. Maybelline NY team did an amazing job on the display, it contained six subway stations, in my station which was called Concrete Jungle, I customize sketch for the guests as the brand debut its new eye palate-City Mini. I was totally blown away by how hugely influential this festival was, so many people from everywhere, some even from Europe! They came together to learn the most trendy make-up techniques, meet YouTubers, Instagram influencers that inspire them daily and visit booth from their favorite brands! My dear friend, fashion stylist Patty was there with me, I could not thank enough how awesome she was! It was so much fun and eye opening experience. THANK YOU to my Maybelline New York family!